Roxas City is touted as the Seafood Capital of the Philippines. Being a Manila guy, my own personal Seafood Capital though is at any branch of Aling Tonya’s at Dampa (I guess I have to forget about that while in the province of Capiz). But aside from the bountiful seafood harvest from the waters around Roxas City, this place still has another dish up its sleeve; Bitoy’s pork barbecue. The day was turning into a scorcher as the festivities of Roxas City’s Sinadya sa Halaran came to an end. The sky was emblazoned in deep blues with wisps of slow moving clouds as our van navigated the streets of the city en route to Bitoy’s Balay Barbekyuhan. Located at the city’s coastal area, it was the perfect place to have lunch while enjoying the view of the nearby beach. Bitoy’s Balay Barbekyuhan is housed in a colorful open-aired structure; surrounded on the roadside by trees and the sprawling Baybay Beach at the other. The group converged at the second floor of the restaurant and watched the locals play with the gentle waves of the sea while waiting for lunch to be served. One by one, our lunch arrived; steamed oysters, rellenong pusit (stuffed squid), seafood caldereta and binakol—a tinola-like dish cooked and served in a coconut shell. Although everyone was already salivating at the seafood feast laid before us, we were still eagerly awaiting Bitoy’s famous barbecue which was still at the grilling pit. Bitoy’s seafood caldereta is a mix of squid rings and shrimps combined with the Filipino favorite, caldereta. I’m not much into tomato-based dishes; so I essentially cheated my way by picking just the seafood in between carrots, potatoes and bell pepper. Everyone then turned to massacre the rellenong pusit platter. The squid is huge and stuffed with the usual garnish of onions and tomatoes. Although the meat is a bit rubbery, it was still a tasty treat. A fourth of my rice was already gone when the Bitoy’s much talked about barbecue arrived. The serving size was huge considering a single stick only costs Php25.00. The meat was very tender and super tasty; probably due to the thick lather of barbecue sauce that was applied to it while being roasted. The barbecue is worthy of the restaurant built under its name. After the feast at Bitoy’s Balay Barbekyuhan, everyone agreed to have a breather before going off around the towns surrounding Roxas City. While everyone started to go back to their own respective lodgings; I decided to stay a bit and explore the beach at the back of the restaurant. Contingents of the Sinadya sa Halaran Festival, tired from all that dancing can now be seen frolicking along the shore of Baybay Beach. A few hurriedly left costumes sat at the shore while their owners ran and swam at the blue waters of the sea. Portions of Baybay Beach’s dark sand are littered with conical sea shells. There were so many of them that at some parts of the beach, I was literally crunching through as I walked. The sun turned fiercer as the afternoon wore on. Alternating between sitting at the shades of trees and walking, I reached Roxas City’s People Park. Still full from Bitoy’s Balay Barbekyuhan, I decided to take a few more minutes to enjoy the view before returning to the comforts of Lawaan Garden Inn. 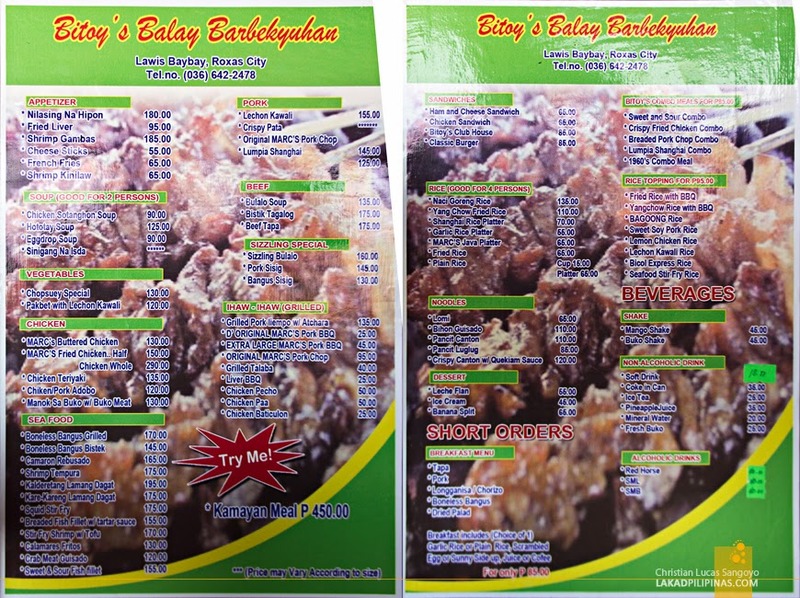 GPS Coordinates: +11° 36' 24.28", +122° 43' 58.76"
I am RG Alba, the graphic designer for the 2015 Bitoy's Balay Barbekyuhan menu. Asking your kind indulgence to use the photos on this blog page as materials for the food menu? Full credit of course. Thanks much! Hi, Sir! Your photos of our province are quite exquisite. May I ask permission to use your photo for our tarp material for a regional event? Thanks!